I fondly remember repairing this and other addo-x products working as an engineer for the company in the north east of England. they were very well built and very reliable. Built from good quality Swedish steel. Known in the trade as the Rolls Royce of adding machines. I have many memories of working in the service department of Addo at their offices in Hatfield, Hertfordshire, England from about the late 1960s to the early 70s. Machines, which could not be repaired 'in the field' would come in and sit on steel shelving awaiting their turn to be repaired and serviced. We would replace broken springs, straighten bent levers and replace worn out cog wheels etc. The big 'accounting machines' were much more complex mechanically having more than one register and a moving carriage. This Addo-X was far simpler and relatively easy to repair. Rubber platens would be given a new lease on life by cleaning with mentholated spirits and we'd give the exterior of the machine a sparkling finish with a creamy car polish before returning it to the owners. I remember the other service engineers, mainly men, but some women, fondly. In the early 1960's I worked as an adding machine "mechanic" (later called "technicians")for a company called Charles S. Meyers, Inc in Miami, Florida. 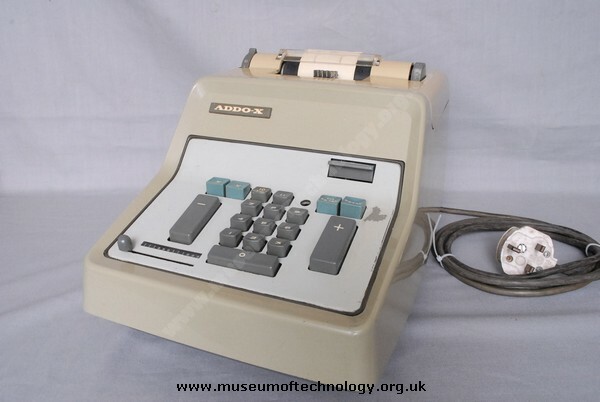 Doing this work for many years, I can safely say that the Addo-x adding machines were the most trouble-free, user-friendly machines in the world! The keyboard feel was its outstanding feature. One could really fly, adding a list of numbers. I began my career in public accounting in 1974 with a large, regional Indianapolis, IN CPA firm. For the first years we used exclusively used this model of the ADDO-X. The older models were metal, which weighed a ton. Later models were make of plastic. You could really fly on these things. To carry the machines into the field we had dark blue vinyl carriers. The ADDO-X was carried with the keyboard up and the back down. We referred the carriers as "dead baby bags"!